Chantal received her Bachelor of Science from The Florida State University in 2013, majoring in Political Science with a minor in Criminal Justice. 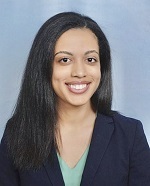 Chantal then earned her Juris Doctor in 2017 from Suffolk University Law School, earning a Pro Bono Service Award. While in law school, Chantal was a student attorney in Suffolk University’s Family Advocacy Clinic, where she represented indigent families in divorce and paternity matters. Shortly after graduating law school, Chantal worked as an Assistant State Attorney in the 9th Judicial Circuit, serving Orange and Osceola Counties. Chantal is licensed to practice in the state of Florida, and defends workers’ compensation cases in the firm’s Miami office.